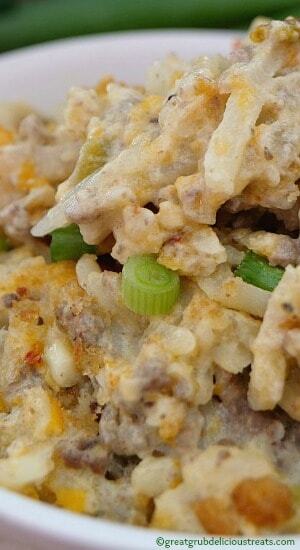 I’ve made many hash brown casseroles in my day but this hamburger hash brown casserole is one of the best. The flavor is incredible and with the crouton topping, oh man, so delicious. This is an inexpensive meal and a family favorite. 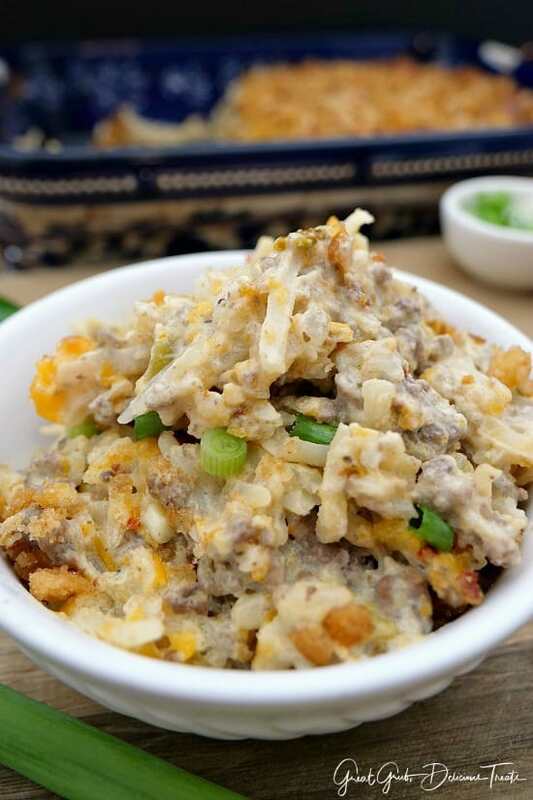 Ground beef, frozen hash brown potatoes, lots of cheese and sour cream, then seasoned just right, makes for one easy weeknight meal everyone will love. Having the sour cream included in this hash brown casserole recipe enhances the flavor tremendously, plus sour cream is just plain delish. 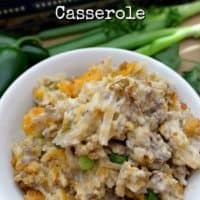 So creamy, and when paired up with the other ingredients, this is one delicious casserole that will be requested over and over. 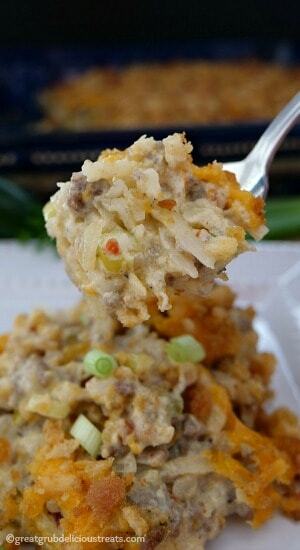 This hamburger hash brown casserole can easily be made in the crock pot or slow cooker. Brown ground beef, onions, garlic and seasonings together in a large frying pan. Drain fat and return to pan. In a large mixing bowl, mix all ingredients together (except 1 cup grated cheese, and topping). Place hash brown mixture in a 6-8 quart crock pot that has been sprayed with a non stick spray. Sprinkle with remaining cheese and the add topping. Cover and cook on high for 4 hours or on low for 6 hours. Super easy and no need to heat up the kitchen. This might not look all that pretty, or appetizing, but let me tell you, looks are deceiving. This. Is. Amazing! We are having a house built here in Texas and our Construction Manager, Mike, talked with my man yesterday about the framing and took him through the house and pointed out each room. Well, one thing led to another and I was making this again (for the second time in 3 days) and delivering a bowl full to Mike. He loved it and his daughter as well. One of my greatest happiness is sharing food and having others love what they are eating. This is a winner my friends! Many variations can be made with this hash brown recipe. Ground beef, sausage, ham and even Italian sausage would be a winner too. 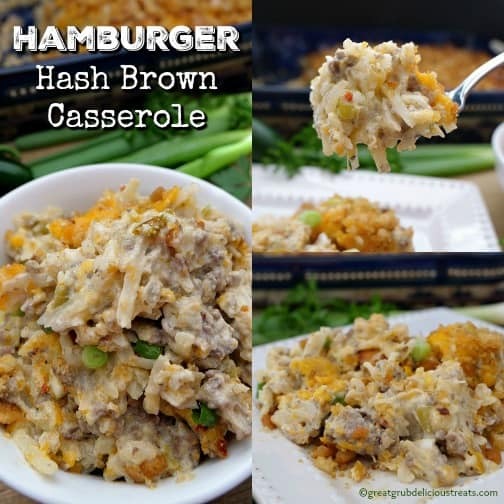 My cheesy sausage hash brown casserole is to die for and is a recipe that resembles the hash brown casserole recipe from Cracker Barrel. So good! 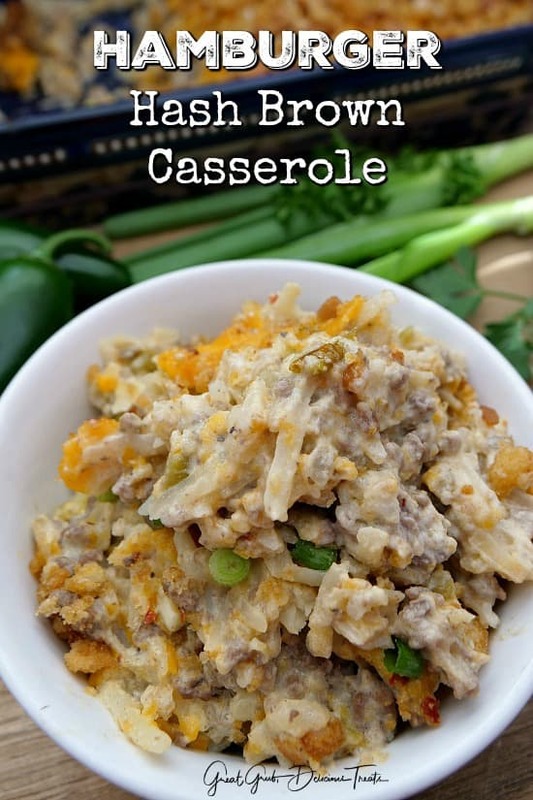 Any way you make this casserole recipe, it will taste delicious. 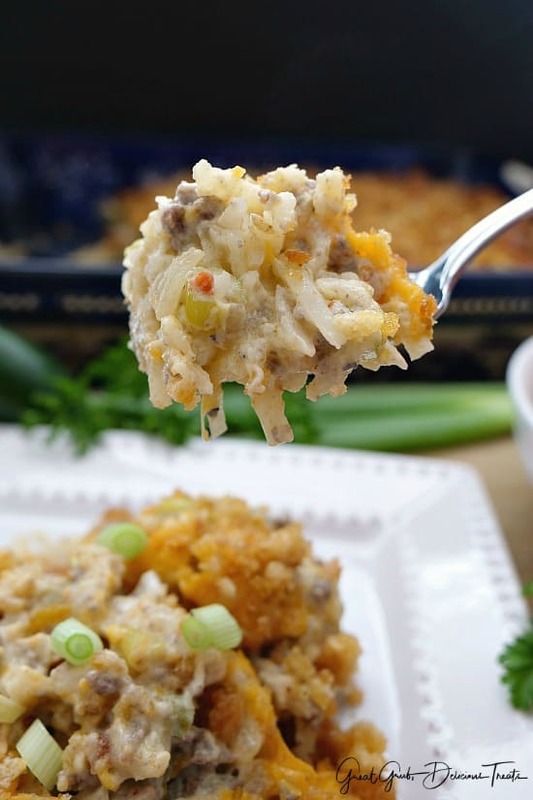 Here are a few more delicious breakfast recipes you can find on the blog: Italian Sausage Penne Casserole, Corn Casserole, Taco Pie Casserole, Classic Lasagna, Cheesy Baked Potato Casserole, Milllion Dollar Pasta Bake, plus many more. Preheat oven to 350° and spray a 13 x 9 baking dish with a non stick spray. Set aside. In a frying pan, cook ground beef, onions, garlic, salt, pepper and crushed red peppers until meat is cook thoroughly and onions are translucent. Drain and return to pan. Place frozen hash browns on countertop to defrost. In a large mixing bowl, mix all ingredients together except the ground beef and hash browns until combined (set aside 1 cup of grated cheese which will be used for topping). Once combined, stir ground beef and hash browns into mixture. Spoon into prepared baking dish and top with remaining cheese. Place croutons into a large baggie, crush, then add melted butter, seal bag and mix together. Place crouton mixture on top of cheese. Cover with foil, bake for 40 minutes. Remove foil, continue baking for an additional 30-35 minutes, until topping is lightly browned, cheese is bubbly and hash browns are heated thoroughly. 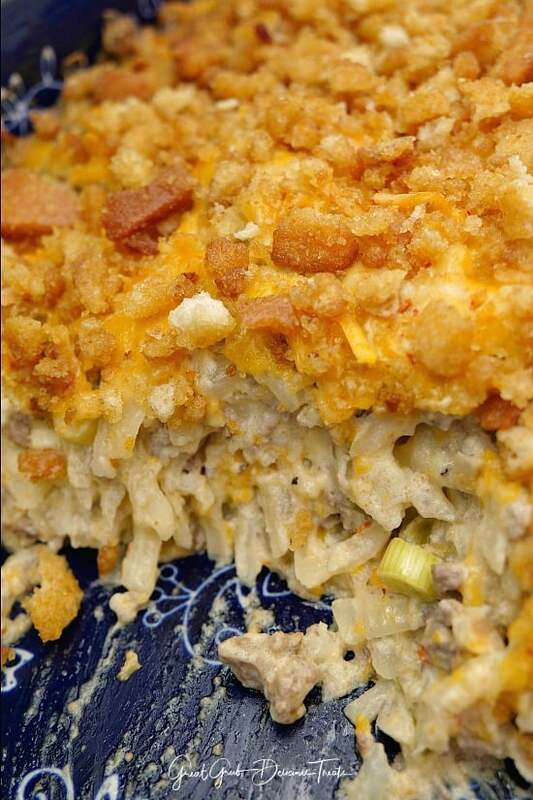 Recipe adapted from my Cheesy Sausage Hash Brown Casserole. Here are a few pics that are the perfect size for pinning to Pinterest.